Relax: Just because there’s a big pile of salt doesn’t mean that a blizzard’s on the way. The city lays in 27,000 tons to start the season, with a contract for up to 40,000 tons if things get snowpocalyptic. 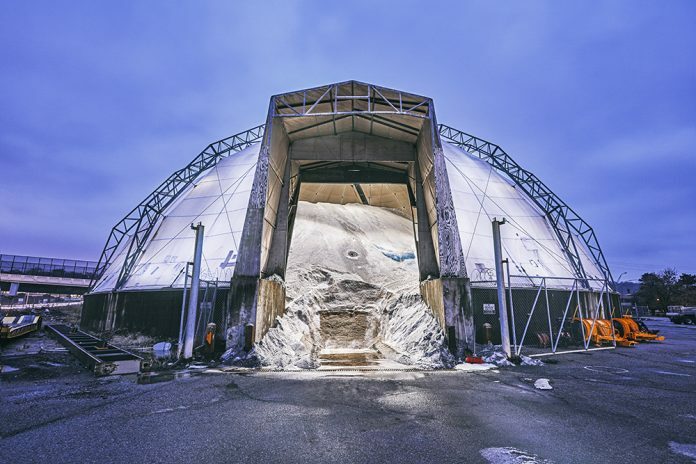 The salt dome in Camp Washington is the largest of four positioned across the city. When snow or ice is predicted, trucks and drivers are dispatched from all the domes, then redirected as the weather system develops. That’s the thing about storms, says Jarrod Bolden, superintendent of traffic and road operations: “You never know what will happen.” The city has a contract with a weather service, and his department tracks the weather through local media and online, too, in order to develop a plan—where to plow and salt, when to use brine or beet juice. But still, Mother Nature can throw a curveball. He experienced that his first winter on the job here. A Buffalo, New York, native, he invited family to spend the holidays in Cincinnati. That coincided with the brutal pre-Christmas blizzard of 2004. “I worked for two weeks straight,” he says.